We strongly recommend that you register online. Registration must be completed in person at the event if you do not register online. Print off your registration form and medical release form for faster service. 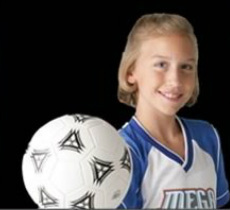 What is Mega Sports Camp? 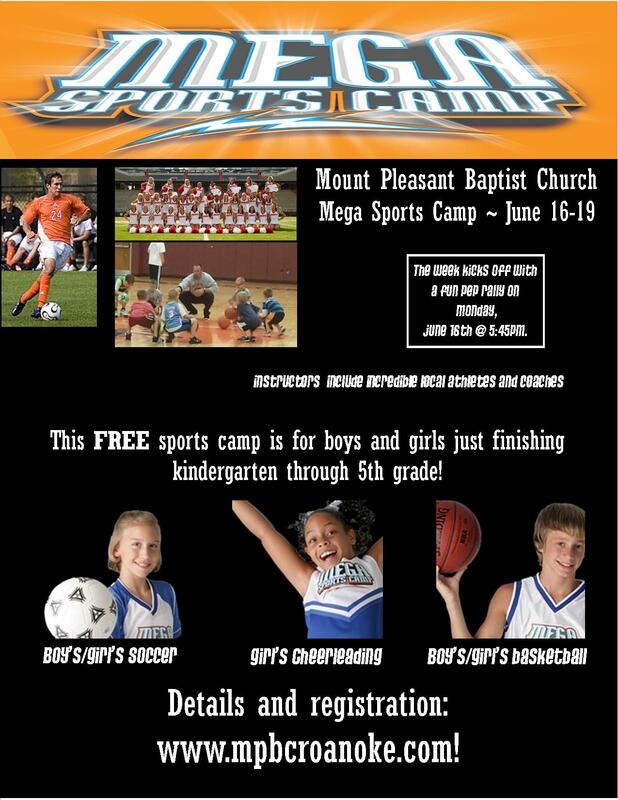 Mega Sports Camp is a totally free sports camp hosted by Mount Pleasant Baptist Church. 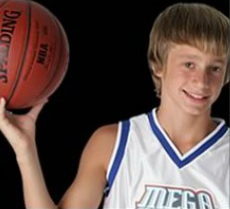 We bring in college or professional level coaches and athletes to offer an exciting time of sports and fun. Each night, we end with a fun devotional by different athletes, which is always a highlight of the week. This year, we will be having a light snack each night for participants. We hope this will help all of our parents as much as possible! 1. What ages is this for? Is there anything for preschool children? The sports camp is for children who have just completed Kindergarten-5th grade. We do offer a very fun VBS-style event for preschoolers (ages 3 and up as long as they are potty trained) at the same time as our sports camp and we invite them to join us! Please register preschool children as well! 2. Are there any costs? 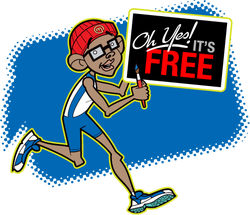 This event is 100% free! We do take up an offering each night to help support the local rec league's scholarship program. Our goal is to reach $500 this year. Also, some of our instructors and speakers have merchandise that is available at the end of the night. 3. How can my child win a prize? Each night, every child who either gives a donation to the rec league, brings a new friend, or knows the memory verse for that day will be entered in to possibly win a prize. THIS DOES NOT APPLY TO THE PRESCHOOLERS as they are a separate program. 4. As a parent, can I stick around and watch? We highly encourage all of our parents to join us for our closing rally time at 7:45pm each night in our gym. If you would like to watch the rest of the camp, you are welcome to do so as long as we aren't a distraction from our instructors. 5. What should my child wear or bring? Please make sure your child is wearing athletic shoes (NO open-toed shoes/sandals/flip-flops). We also recommend each child bringing a water bottle with their name on it. If your child is participating in soccer, cleats and shin guards are highly recommended. Cleats can be worn on the field, but must be taken off when entering the gym. Also, each day we will encourage all of our kids to wear a specific "theme". Monday- Wear your favorite sports team! 6. I see that you offer 3 sports. Can my child pick more than 1 sport? We do encourage all children to pick 1 sport. If your child needs to change to another sport, we can work around that. Please see the registration table to make any changes. 7. Where will it take place? All participants begin in the church sanctuary. From there, the cheerleaders will head outside and the basketball players to the gym. Our church bus will take the soccer players to the soccer field across the street (we use the bus so kids aren't crossing the street). 8. What if it rains? Basketball will always take place inside while cheerleading and soccer will be outside. If it rains, the cheerleaders will come inside. For those doing soccer, we will allow them to join the basketball players on that day. 9. What are the cheerleaders doing? Will it be safe? They will be teaching/perfecting motions, cheers, jumps, etc. There will be no stunting or tumbling to ensure safety. 10. How do you pick your instructors and guest speakers? It is our goal for our children to see college and professional level athletes who have a personal relationship with Jesus Christ. We work with several Christian sports organizations, seeking to bring in athletes who both relate well with children and who have a good Christian testimony.